There was a time when much of the very best loudspeaker technology emanated from the UK - but sadly, for the most part, those days are over. With the singular exception of B&W, most truly interesting and high-class loudspeaker design now comes from North America, the Far East and elsewhere in Europe. Of course, some companies design their products here and have them built over there - in the Far East, mainly - KEF being a prominent example. Monitor Audio is also associated with Far Eastern manufacture, albeit for cost reasons. Since Mo Iqbal relinquished the company's reins a decade or so ago, the brand has been principally involved with technologically conservative low- to mid-range loudspeakers, which might be described as 'mainstream affordable'. In the main we're talking about loudspeakers that don't sap amplifier resources unduly, and which are mostly reasonably compact and affordable, if sometimes a bit too sharply dressed to blend in with many domestic surroundings. But here's a new departure for Monitor Audio - an unashamedly luxurious, technically ambitious loudspeaker that's the result of a 'blue sky' project, where decisions about materials and construction techniques have been made with a purist focus, and largely without regard to cost or technical difficulty. This marks the entry of the long-established brand into the high-end market. The voice-matched Platinum range includes a smaller two-way derivative - which could be used either as a stereo speaker or as a rear speaker in a multichannel system - a centre-channel speaker that, technically speaking, is very closely related to the model tested here, plus the obligatory subwoofer, of course. The aim for these models was to marry traditional British craftsmanship with what Monitor Audio describes as "benchmark" performance. This would appear to refer to consistent sound across the range, with greater refinement and musical integrity than with previous efforts, as well as very low distortion and a considerably broader frequency coverage (>50kHz), appropriate to the bandwidths ushered in by media such as DVD-A, SACD, HD-DVD and Blu-ray. Responsibility for this ambitious project was assumed by a recently expanded team of acoustical engineers and industrial designers, led by technical director Dean Hartley and based in Rayleigh in Essex. Monitor Audio has also introduced in its own 3D modelling, finite-element simulation and a Klippel distortion-analysis system supported by an in-house anechoic chamber. This investment is clearly intended to pay further dividends with future projects. The PL300 is an imposing loudspeaker, standing as it does at over 1.1 metres tall and set against broad shoulders and a deep cabinet. The side panels are alternatively bowed inwards (at the back) and outwards (at the sides) for resonance-control purposes. It's a three-way, four-driver design, with two identical 200mm bass drivers, a 100mm mid unit and - in a complete break with Monitor Audio practice, which has always previously favoured metal domes - a proprietary ribbon tweeter. Bass loading is via two rear-facing, rifled HiVe II high-speed vents. Front baffles, plinths and the midrange housings are cast from an anti-resonance composite (ARC) material, a thermoset polymer that's loaded with minerals to provide very inert, optimally damped assemblies. The ARC material is cast to form a tapered line enclosure for the Platinum's midrange driver. The main enclosure's front and rear panels have additional reinforcement from long steel support struts that are tightened to a specific torque as an additional resonance-control method. They're barely needed, however; the internal construction of the PL300 and the build of the main chassis itself shows a great deal of attention has been paid to this major parameter. The standard of fit and finish on the model is nothing less then exquisite, and this includes the quality of the adjustable spiked feet, the WBT Platinum Signature bi-wire terminals and the 11 layers of clear-gloss piano lacquer that highlight the wood grain. To add a little extra touch of luxury to the package, along with some additional damping (though this isn't its primary purpose), the baffle is upholstered in Strathspey leather, which is said to be superior to other leathers sometimes employed in similar applications. The woods used are Santos rosewood and natural ebony veneers. The drive units clearly aren't from the standard Monitor Audio parts bin. All driver surfaces employ ceramic-coated aluminium/magnesium (C-CAM). On the bass and midrange units, the cones consist of cores of Nomex honeycomb resins sandwiched between thin C-CAM layers, the concave cone profiles shaped with the aid of FEA analysis. High frequencies are generated by a short and not excessively directional C-CAM alloy sandwich ribbon, with a neodymium rare-earth magnet. The ribbon doubles as the voice coil, and weighs just 18mg (less than half the weight of a typical high-performance dome), which helps account for the impressive 100kHz tweeter frequency-response limit, key to the speaker's ability to complement the new broad-bandwidth formats. The ribbon is also very narrow, which means a wider then usual lateral dispersion, the limited height causing a more than usually curtailed vertical dispersion too. This review was carried out shortly after moving to new premises, which of course meant a new listening room, with completely different acoustics to those this particular reviewer is accustomed to. The room is tall, moderately wide and about 12 metres long, so there's plenty of air to stir. We were told in advance that our review speakers were well travelled, having been used as demonstration models in other countries. In any event, we could detect no warm-up or running-in traumas that weren't directly attributable to the other components in the system. In fact, there were no traumas of any kind, which compares favourably with most of the high-end speakers we've used in the recent past - though we suspect the Focal-JMlab Utopia Be would have been an interesting match, as well as offering even greater low-frequency bandwidth and maximum volume capability. Not that the PL300 is particularly limited in either department. The bass is well extended and very clean and agile. It's more than capable of sustaining fortissimo orchestral playing with real power and authority, and its speed and agility are even more impressive than its sheer depth, though having said that, a smaller room would probably have thrown the spotlight more firmly on the low-frequency 'presence' end of the spectrum. But with the right music, performed properly, the PL300 can mount a musical picture of devastating authority and weight, without any noticeable overhang or excess. However, it's in two other areas that this speaker is most impressive. First, there's the almost complete absence of coloration, and the model's corresponding transparency. The only speakers that come close in this area are top-end electrostatics. The sound possesses a sharpness, clarity and precision, but with absolutely no detectable overhang. This is certainly linked to the very subtle discrimination the PL300 provides to high-frequency musical content, and the airiness that's often heard from top-class wide-bandwidth tweeters. 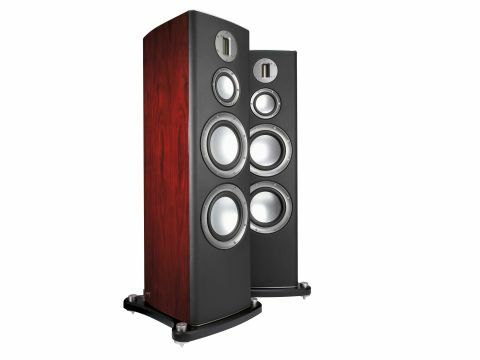 In many ways it's suggestive of the performance of the Focal beryllium tweeter and the B&W diamond tweeter, which are certainly the best domes currently available. The sounds of individual instruments are particularly well served, with a very subtle, tactile quality where the music demands it. For example, the individual strings on an acoustic guitar and glissandi from a harp - which, with poor reproduction quality, may be masked in orchestral recordings - are incredibly striking. The effect is nothing short of breathtaking, providing some real spine-tingling moments, in a way that you often hear in a live music event, but rarely encounter in the reproduced article. There's similar quality with one of this month's featured recordings, the Natalie Clein recording of Elgar's Cello Concerto, which from the first note brings the solo instrument to life in a remarkable and thoroughly tactile way. The electrostatic-like quality of this speaker, despite having no electrostatic transducer built in, was noted explicitly by a number of visitors. The second area where the PL300 truly excels - even outshining other speakers with ribbon tweeters - is its dispersion. The tweeter has a broad lateral radiation pattern, which makes it more usable than expected - even well off the tweeter's main firing axis. There's some roll-off when listening from either side, as the PL300 can't repeal the laws of physics, but the change in voicing is remarkably modest with changes in incident angle, and there certainly isn't the marked 'hot seat' effect characteristic of ultra-wide-bandwidth domes. Unsurprisingly, there's more variation on the vertical axis, although it's not excessive, so that standing up and moving around the listening room while listening casually at least, doesn't result in any disproportionate change in voicing. There is a positive side effect here, which is that floor and ceiling reflections are effectively damped down. We noticed that a point in the room that tends to sound rather bright, apparently associated with a projecting RSJ strut running across the room, was less affected than usual using this Monitor Audio speaker. Earlier on, we described the Platinum series as unashamedly luxurious, with the clear implication that they're also unashamedly expensive. Well, they're not cheap, but £5K for a pair of speakers of this complexity, build quality and, above all, musical performance is far from extravagant. The overall musical effect is very expressive, airy and natural, with a clearly well-extended response, especially in the high treble.